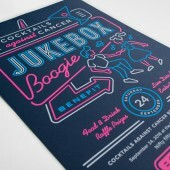 About Kathy Mueller : Kathy Mueller is an award winning graphic designer and educator in Philadelphia. She received her BFA from Moore College of Art & Design and her MFA from Temple University Tyler School of Art. Mueller teaches Art Direction in the Advertising Department at Temple University. She serves on the Women’s Leadership & Diversity Initiative Committee of the Philadelphia Chapter of AIGA, the professional association for design. Special event and programming branding is an area of focus at Kathy Mueller’s studio. Mueller has designed campaigns for music festivals, charity receptions, cultural events, academic symposiums, as well as personal commissions for wedding and special occasion invitation suites. Mueller’s event branding and special occasion work has been recognized by Art Directors Club, Creativity International, GD USA, and appeared in Rockport Publishing and HOW Books publications. 2014, Graphic & Interactive Design, MFA, Temple University, PHILADELPHIA/USA. 2003, Graphic Design, BFA, Moore College of Art & Design, PHILADELPHIA/USA. 2010-Present, Assistant Professor of Advertising, Temple University, PHILADELPHIA/USA. 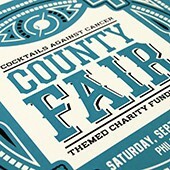 2008-Present, Designer, Kathy Mueller Design & Art Direction, PHILADELPHIA/USA. 2010-Present, Book Team Member, Designing Brand Identity by Alina Wheeler, PHILADELPHIA/USA. 2007-2010, Adjunct Instructor, Moore College of Art & Design, PHILADELPHIA/USA. 2005-2008, Graphic Designer, Kanter International, PHILADELPHIA/USA. 2016, “SeeHER”, RISD Graphic Design Commons, PROVIDENCE/USA. 2015, “Best in Show”, MSU Visual Arts Center Gallery, EAST LANSING/USA. 2015, “Hot for Teacher”, AIGA Philly SPACE, PHILADELPHIA/USA. 2014-2015, “Type Directors Club 60”, 19 cities in 10 countries. 2014, “Semicolon”, New Boone Gallery, PHILADELPHIA/USA. 2014, “Brains Muscle Wildcard”, Temple Contemporary, PHILADELPHIA/USA. 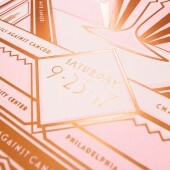 2013, “Those Who Can Teach”, AIGA Philly SPACE, PHILADELPHIA/USA. 2015, Regional Design Award, Print, NEW YORK/USA. 2015, Silver Award, Creativity International Awards, LOUISVILLE/USA. 2015, Gold Award, New Talent Annual, NEW YORK/USA. 2015, Merit Award, New Talent Annual, NEW YORK/USA. 2015, American Graphic Design Award, Graphic Design USA, NEW YORK/USA. 2014, Student Award, Applied Arts, TORONTO/USA. 2014, Merit Award, Art Directors Club 93rd Annual, NEW YORK/USA. 2014, Communication Design Award, Type Directors Club 60th Annual, NEW YORK/USA. 2013, Semifinalist, Adobe Design Achievement Awards, MOUNTAIN VIEW/USA. 2013, American Web Design Award, Graphic Design USA, NEW YORK/USA. 2011, American Web Design Award, Graphic Design USA, NEW YORK/USA. Press Members: Request an exclusive interview with Kathy Mueller.